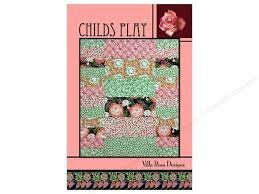 Villa Rosa Designs Childs Play Pattern- This special quilt uses only six fat quarters for the top. Make this quilt in no time for a quick gift. Fat quarter friendly pattern. Finished size about 39 in. x 45 in. Instructions and diagrams on a 4 in. x 6 in.